The Aliki Tower condominum complex is one of the most luxurious and unique properties in the Daytona Beach area. 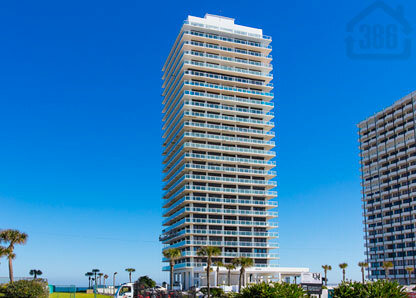 Imagine owning the entire floor in a beautiful oceanfront condominium in Daytona Beach. Now stop imagining, as you realize you’ve already found it here at Aliki Tower. One of the few buildings that offers this lifestyle, this is one of the most private condominiums in the Daytona Beach area. Aliki Tower offers an amazing architectural design which allows for maximum balcony space and layout square footage for your daily postcard-worthy views of the Atlantic coastline. Enjoy instant access to the sun and sand outside your backdoor, and find convenience and comfort in the Aliki Tower concierge services, beautiful landscaping and an oceanfront pool and pool deck. Call us today to explore available options in Aliki Tower or any other Daytona Beach area oceanfront condo.